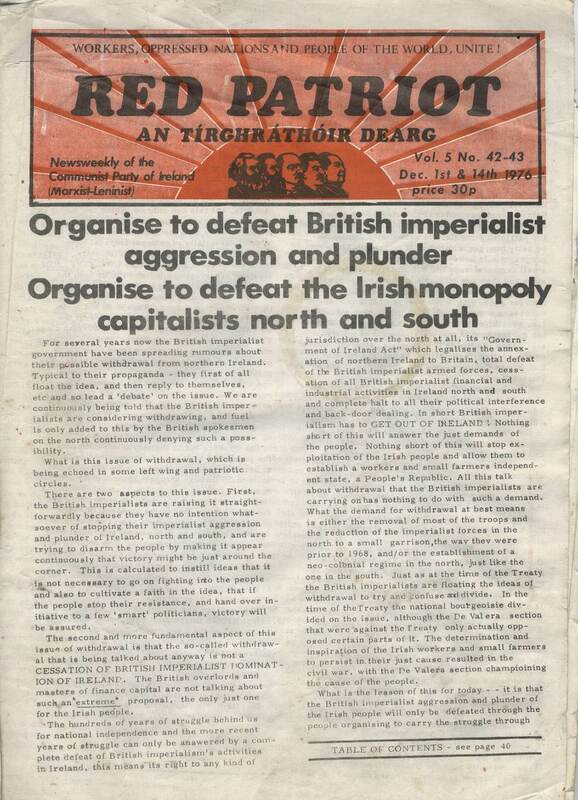 Posted by irishonlineleftarchive in Communist Party of Ireland (Marxist Leninist), Irish Left Online Document Archive. Continuing the trawl through the archives this week I turn to the Communist Party of Ireland (Marxist Leninist). And never was a hyphenated two word suffix so important in political terms. Because you see the CPI (ML) were not like other parties. Others might organise in constituencies, others still might harbour utopian dreams. But for the CPI (ML) the thought was as important, indeed more important, than the deed. Their publications were important but the membership was more important. Some might be Marxists, others might be Leninists, but only the CPI (ML) members were true Marxist-Leninists. Sure, first in 1965 they rejected Kruschev, but rejection became addiction as they then claimed to be Maoists, in 1978 they rejected Mao, then turned to Albania and Enver Hoxha, and all the while retained a startling fondness for Stalin. Quite how this translated into practical activity was never entirely clear. There was the “Spirit of Freedom” group which I seem to recall giving talks broadly supportive of the IRA and after that? Not much really. They had long long before I encountered them, contested elections in the North, but I never saw much evidence of any serious political activity by them outside of student unions. To be honest – and I dislike saying this about any left organisation – I found the members of the CPI (ML) an unlovable bunch. The words arrogant and conceited spring most readily to my mind. And this was peculiar because for a group with a membership as small as theirs they had no real reason to be either. Tommy Graham wasn’t so bad, and I never knew Doris, but others I found extremely antagonistic. Now granted, being more or less the sole Stick in SU politics at the time didn’t help – but it wasn’t directed personally at me but rather a diffuse antagonism to all beyond the party. Where ever one or more would gather there was a point when the talk about ideological purity became wearing. Usually that point was sooner rather than later. And with no disrespect to them, at the time hearing about the joys of Marxist-Leninist thought in relation to Albania (Albania!) always seemed a bit sort of — well twee. On the theoretical side they never amounted to much. I may be being a little unfair here, but I can’t think of one fresh idea they brought to the feast and in a way that was quite predictable. They weren’t about fresh ideas. Instead – with a steadfastness that would have been recognised and admired by Archbishop Lefebvre – they maintained a steely adherence to stale stale ideas centered around a reductionist Marxism. And in a way it’s important, but probably impossible at this remove, to convey just how profoundly odd they were. Modernity had seemingly passed them by. Graham was blessed by what seemed initially to be the great good fortune to look rather like someone from the 1930s Supreme Soviet – the only problem being that that someone happened by a further somewhat more careless accident of fate to look rather similar to one L. Trotsky. That he – and others assumed the demeanour of those same members of the Supreme Soviet was hardly coincidence. I could never quite work out whether they were in any real sense serious. Why would one join them? What was the attraction of one of the most utterly and rightly discredited strands of left thought in history? After all Stalinism wasn’t exactly a pretty word in the political environment of the 1970s and 1980s, whether it was dressed up in Maoism or the thought of Enver Hoxha. The CPI and WP – for all their admitted faults – were more engaged on a critical level and had taken on board the idea that the Stalinist period was not an unalloyed good. And if one were that picky, the SWM or Militant offered brands of Marxist Leninism entirely untainted by Stalinism. Or coming at it from the direction of Republicanism why not just join SF rather than acting as a cheerleader? So the question was, and to some degree still remains, was this all some sort of elaborate hoax, or art performance or just a rather middle class endeavour? Actually all the blood and thunder about Stalin and Hoxha always seemed to be a facade. They were always trailing around on PSF’s coat tails, in a sort of exaggeration of the SWM’s fetish for all things Republican and militant. And their vehemence about the national question or Marxist-Leninism tended to seem detached from reality. Their periodic visits to Albania raised hilarity more than admiration – one wonders what the Albanians made of them. Although one suspects that as with many of these groups the fact that they didn’t have an ‘army’ meant they didn’t really count. Curiously though on a day to day level they garnered a lot of respect in the strangest places. Perhaps it was because Doris had been head of USI, or Graham and another guy had been Presidents of the SU’s in the DIT, or perhaps it was the sterness of purpose they projected, but I saw otherwise intelligent people nod approvingly at some fairly asinine pronouncements simply because of the source they came from. And always, always that tendency to overstate. The CPB(M-L) from the beginning adopted an ingenious device to avoid the danger of being torn apart by the political disagreements which were destroying their rivals. The party deliberately confined itself to making very general statements of opposition to imperialism and support for the working class. The only exception to this was support for guerrilla warfare, such as had brought Mao to power. The British labour movement’s adaptation of Mao’s tactic was to consist of localised strikes which were not to make the mistake of linking up and making generalised demands. To do so would be equivalent to the peasant masses lining up in massed formation to oppose an imperialist army, instead of taking to the hills. The strategy went down well among Reg Birch’s right-wing colleagues on the AEU executive where he was comfortably ensconced. They had always wanted to avoid fighting the employers, and as they lacked the power to stop local shop stewards leading a fight, Birch’s ideas suited them nicely. That might have been as a result of belonging to such a minority strain in Irish (and Lord knows) global leftism. A typical speaker from CPI (ML) would assume a declaratory mode much in the style of Lenin addressing the most recalcitrant of Bolsheviks even when making the most minor of procedural points on some student union matter. They didn’t tend towards the old trick of much of the student based left of assuming a Dublin or working class accent. Probably for the fairly sensible reason that few enough of them were working class, indeed in my recollection there was more of a tendency to adopt a very slightly faux Northern tone. A close friend of mine at the time – very much not a WP supporter – expressed a passing interest in the CPI (ML) and for years after would have members arrive at his door unannounced to hector him about their policies. His partner happened to be English and both he and she were extremely upset by the vehemence of the rhetoric used by the party when discussing the North to the point that on one occasion they were asked to leave and never return. Anyway, enough impressions. Here cpi-ml.pdf is a copy of their journal Red Patriot from 1976 (note how the year punk broke passed them by!). This was I think just before the Sino-Albanian split, but already the primacy of Hoxha is evident. I can’t help but admire the excuse on the back of the journal for the absence of No. 42 which ‘was due largely due to obstacles which the Red Patriot Editorial Staff cannot avoid but must deal with by revolutionary means…’ or the apologia for Lysenko and his enormous achievements through the correct application of dialectical materialism. But it is the language that is most telling. Some of the articles appear to have been written in a fairly level headed fashion, but between them are pieces presented in an almost enraged discourse that for those who knew them in the flesh is all too recognisable. The CPB(M-L) then (in the mid-1980s), abruptly and without explanation, altered their world view and declared that the Soviet Union, previously described as an imperialist state ruled by counter-revolutionaries, was a bastion of socialism. Did this mean that they were bidding for the Moscow franchise? It was not as simple as that, and an understanding of the party’s reasoning demands a grasp of dialectical thought. Stalin had established that there could be socialism in one country. Therefore, there had to be a country for socialism to exist in and Russia’s claims were the longest established. The ‘Tankies’ in the CPGB hoped that the CPB(M-L) would dissolve its separate organisation and return to the fold to assist in the fight against the ‘Euros’, but it was already too late. Secrecy has become an obsession with the CPB(M-L), and members have taken to denying that their organisation exists, or that they know anything of its history! How can a non-existent party be dissolved? Members do not divulge either their membership or the party’s existence to colleagues at work. Their journal, The Worker, still exists, but is no longer sold openly. Sociologists of religion are familiar with this phenomenon through the study of the revolutionary sects of the seventeenth century, some of whom survived for a very long time by adopting passivity and a secretive way of life. The CPB(M-L) may be slowly disappearing from view: if you are in touch with any of its members, it is essential that you do nothing to alarm them, as it would be a loss to science if they become so secretive that they can no longer be studied. I laughed out loud when I read that. Great post and really interesting for people like myself who came along after the CPI (M-L) but have heard about it on occasion as an example of the madness that can consume groups and individuals operating on the fringes of the left. ‘Summary of the Report on the Activity of the Central Committee of the Party of Labour of Albania’. ‘Works of Enver Hoxha’ including the unforgettable ‘Speech delivered October 3rd 1974 at the meeting of electors of the 209 Precinct Tirana’. Not much room for sitting on the fence with these lads one suspects. Great post, WBS-I’ll savour the “organ” later. Incidentally I’ve just dug out my own CPI (ML) missive- a 132 page booklet from September 1986 entitled “Unity and Freedom to the Irish People!” “Against the fascist divide and rule Anglo-Irish agreement!” rather strernly it has chapters informing us -“Fascist terror in the north to conjure up bogey of civil war”, “Religion could never be the issue”, and of course mentions the “Collaboration of Labour aristocracy, social democracy and revisionism”. Believe me folks its hard to convey the vitriol of this sect-certainly blood and thunder, but also entertaining-can they be serious? Like Frank you’ll laugh out loud. They really were an extraordinary bunch, the CPI(ML) – I recall their election campaign in Fermanagh in ’74, and then later when I got to Dublin they would pop up here and there. They were a bit like the Sparts, only ruder and more dogmatic, and their accents were mostly British instead of American. The organ is deadly crack though – I especially liked them sticking the boot into the BICO. That really unique Hardial Bains literary style, with the addiction to the four-sentence headline… It may be something he brought with him from India, although I always remember Ganashakti being a bit zippier. Their parent group in Canada write very much the same kind of stuff. It would be interesting to know what these guys are doing now, apart from distributing History Ireland that is. franklittle, I don’t think they recognised there was a fence. More like a trench with them firmly on one side of it lobbing rhetorical bombs across. I’d love to see the 1986 version redking. I’m sure I’d recognise some of the guilty parties…Unfortunately scanning is no fun at all. 42 bloody pages that thing was. Dogmatic is exactly the word splinteredsunrise. Although as you say the Sparts were a close second. I’m genuinely curious as to what political approach their former members would take now. Anyone know any of them? You never know, if they did go down that underground, Sticky-style secret cumann road of organisation, you could be sitting right next to one and you’d never know it. 🙂 or is it :O ? I considered the CPI(ML) back in the 80’s (and now) to have been principled communists who had not bought in to the eurocommunist illusion of peacefully co-existing with imperialism. Most of them were Irish – in fact their publications such as ‘Marxist-Leninist Weekly’ frequently contained articles in the Irish language. I disagreed with their ultra-leftist characterisation of the USSR as a ‘social-imperialist’ state. Still, they were held in some regard by a number of republicans as they were unafraid to show support to our movement at a time when no other group on the pseudo-‘left’ did so. Not to be picky Martin, but the CPI (not CPI-ML) was somewhat supportive, the SWM was arguably more supportive and many members of Peoples Democracy joined Sinn Féin in the late 1970s and early 1980s. I’d completely disagree with your characterisation of ‘euro-communist’ being wedded to the illusion of peacefully co-existing with imperialism. If you look at the record of those parties that comprised the euro-communist camp back in the day you’ll see that they were and have remained staunchly against the Iraq war and other conflicts. Firstly a memory. It was about 1984 in Bruxelles. I was drinking with a pal who had gone to the anti-Reagan demos but was not bothered in politics beyond that. In walked two men selling Marxist-Leninist Weekly. I had heard the CPI-ML speaking in Henry Street one day and had actually gone into their Progressive Books on the quays, (not too far from the CPI’s shop in Temple Bar actually) and havbe a conversation with the bloke in there. It may have been Tommy G but I’m not sure; he did have a certain distinctive look. I had soon ascertained that a) they were not pro-Moscow (a plus) b) they were pro-Albania (a minus) c) they were off their heads. So I knew that the lads would be an interesting diversion for my mate. I told him to buy a paper and engage them in conversation but to announce early on that ‘Stalin was the butcher of the revolution.’ I went to the bar and watched. I knew he had said the Stalin bit when both of the lads started shouting at him and attracted the attention of others in the bar who thought a fight was breaking out. They then turned and their heels and stormed out, one shouting back that ‘Trotsky got what he deserved!’ When my man had said that Stalin was the butcher etc, both had lost the plot and one immediatlely suggested that he was ‘a police spy and Trotskyite liar’ while the other said that ‘Trotsky was a Hitler agent and counter revolutionary.’ My mate hadn’t mentioned old Leon but they presumed correctly that someone had been feeding him Trot propaganda. On reflection this was a childish prank, but I was 17 and was quite childish in many ways. It confirmed for me that the CPI-ML were a bit special. As for the CPI-ML’s pro-republicanism I presumed that most republicans (of the Provisonal variety) thought them just a crazier version of the multitude of sects (my own SWM included) who would swarm around anti-extradition marches and the like offering material that supported/and or denounced them at the same time. I will return to that subject if anyone is interested. I was a bit old for Bosco but Wanderly Wagon was a formative influence. A good laugh as I remember, though some didn’t think so. We in the SWM of course reckoned we were great wits, but we didn’t like people laughing at us. WBS, I will get back to you on this…it has brought back painful memories and some embarrassment! The only CPI-ML member I ever met (this is long after their heyday) impressed with his knowledge of Eritrea and southern Sudan. Apparently this was a result of his party’s solidarity work with those areas, something I’d like to know more about. He also told me ‘we thought North Korea had the right model, but we were worried they were too soft’. Go figure, as they say. . . The answer is quite simple: the Irish are a nation of bullies, bullies’ sycophants and bullies’ enablers. interesting articles (the top capitalists in Britain, for instance). were once a big issue for the Irish Left. for Communist Unity. If they were in the CDRCU, this must have been before they joined the Irish Communist Group. Nowadays, they’re trying to defeat a very different kind of “revisionism”…. The wheel turns, the wheel turns. But generally I find it brings people back to where they started. Which reminds me. I hate that ‘socialists when they’re 20, conservatives when they’re 30’ stuff. Seen that and put it down to cynicism, etc. Sure, life changes people. It has to. But core beliefs should be, y’know (as T. Blair would put it) core beliefs…. I’d love to see the Aubane group theorise how they ended up back where they started if they did. Not beyond their abilities though I’d say. Although if Eoghan Harris can claim consistency, maybe they can too. Yes, and I love the way he keeps dropping ‘social democracy’ into his columns. I’m not quite certain that he has got to grips with the concept. Populism, aye, that’s a different matter now. subject. I know, because it happened to me on Indymedia. Cornelius Cardew was invovled with CP (ML)? of his experimental music (Not being”socialist realist” music). Cardew was a leading member of their British affiliate, what’s now the RCPB(ML). Rod Eley who ended up heading the ML’s over here was in the Scratch Orchestra with him. Cardew did actually have quite a worked-out theory about how his music served the people, but I can’t for the life of me recall the details. of its members moved to the Irish Communist Group afterward. the UK/ROI at this time? There are a few things I’d love to add to this thread when I have the time. The first post is excellent; you’re a modest bunch! I never heard that Cardew had a connection with the party but I’ll consult a colleague in the morning who was a long-time member and who knew most of them. I was a student in Trinity in 1976 when David Vipond of CPI ML was elected as President of the Student Union. He was a compelling speaker and speaking with a megaphone on the Dining Hall steps he could empty the Buttery at lunchtimes in the pouring rain – not everyone agreed with him, but they knew that had to understand why. After he was elected he then disappeared and spent 6 months campaigning against Enoch Powell in the South Down bi-election. After winning 100-odd votes, 5 of them marched back into Trinity behind red banners and claimed a great victory for the working classes. All they had was their party banner, ML Weekly and a few supporters – but they hammered it out to all and sundry. Just want to say, as has been pointed out, the CPI(ML)’s English counterpart wasnt Reg Birch’s CPBML (note the absence of ()’s – important for spotter purists). Their fraternal comrades were in fact the Communist Party of England (Marxist-Leninist). These days known as the Revolutionary Communist Party of Britain (Marxist-Leninist). If I am not mistaken, the namechange came when they flipped from Maoism to Hoxhaism. They swapped Albania for North Korea when Ramiz Alia did the dirty. Hardial Bains’ partner still leads their flagship Communist Party of Canada (Marxist-Leninist). Ah, I didn’t know that J re the CPE (ML). I actually have some of Reg Birch’s stuff which I’ll post up soon. Must see if I can get some CPE (ML) material, unless you have some?